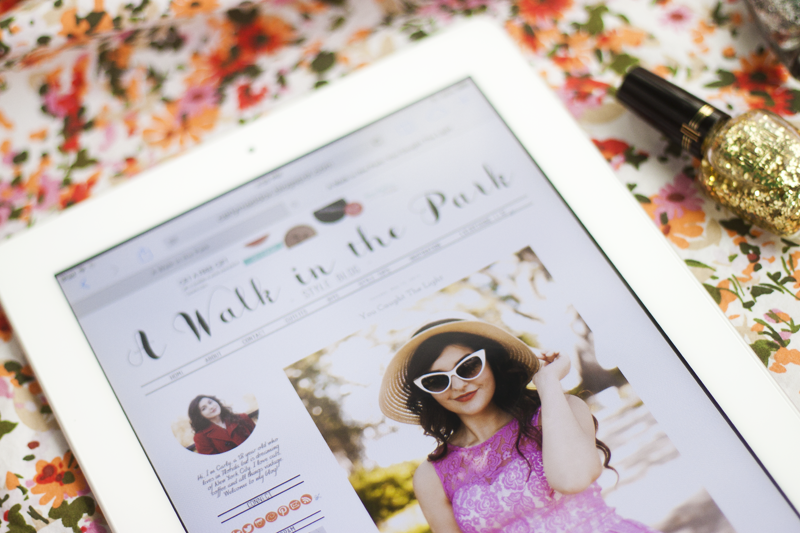 The way your blog is designed can really have an impact on your blog and the views it receives. Since it is the first thing a person notices when they visit your blog, it can really effect their decision on whether or not they feel that your blog looks appealing enough to scroll down the page and actually read the posts. While the design itself isn't an active contribution to your content and what your blog has to offer, it's a given that someone will find an organized, well-designed more appealing than a messy, boring, all-over-the-place design. But, designing your blog requires some knowledge of HTML + CSS coding, and a lot of people don't know how to do this, that's why paying someone to professionally design your blog is a possible option. Unfortunately, some may find that this is a bit pricey, including me! That's why I've put hours and hours into learning basic coding and finding out what makes a blog's design look most appealing, so I can share 10 tips for self designing your blog here with you all who are either just starting your blog, trying to find a way around paying expensive prices to have your blog professionally designed, or simply just needing a few pointers! Before you begin anything else, always back up your blog and your template, that is so important in order for you to not lose anything important. After this, before you start designing, make sure you pick a theme for your blog that fits your you and content. For instance, if you have an urban style, design your blog around that, with more "urban" features, which may mean more monochrome colors and bolder, simplistic fonts. If you have an urban style and your content on your blog reflects that, it wouldn't be the best idea to design your blog with a rustic or vintage style. That will mislead whoever is viewing your blog, and it will seem like you're confused on what you're trying to show on your blog. If you don't have a certain specific style or content type, designing your blog with just a simple white background and a black font for your header is always a good go-to, because it keeps things looking clean and organized, putting more of a focus on your content. Blogs like The Sartorialist and Native Fox keep a very clean, simple, and organized design and layout going on their blogs. These styles can fit just about every blog, and it offers for the reader to pay special attention to the features included in your blog. I think these are especially good if you're main focus is street style and outfit posts. 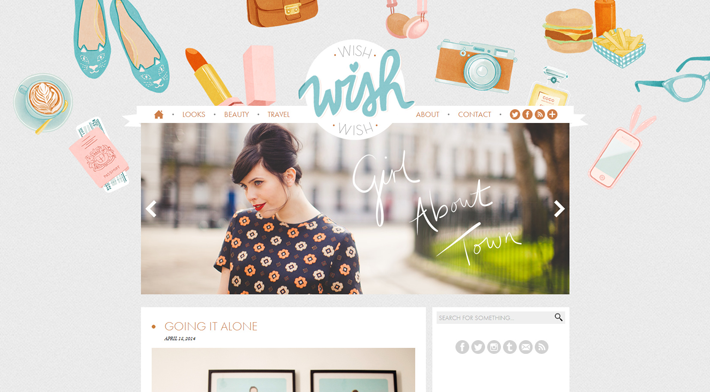 Another blog design that I love is WishWishWish's design. It's cute and colorful without overdoing it, and it's perfectly Carrie. I've been following her blog for quite a long time now and she's definitely one of my favorites. While she had someone put together her design layout and it would probably be pretty hard for someone with very limited knowledge on designing a blog layout to do something like this, it can still inspire you, and you can create your own style with some of your favorite blogs' design elements in mind. In order to keep a good consistent theme and flow going throughout your blog's design, it's good to keep your amount of colors and fonts limited, so your blog will have a clean, organized, professional look. When choosing your colors, I recommend keeping it limited to 2-3 colors, keeping 1-2 a neutral or monochrome color, so that your other 1-2 will be your main "pop of color" on your blog. If you're unsure of what colors to pick or just want to keep a black and white look, that's completely okay! If anything, I think that can sometimes be better, because this way your main color and focus will be shown through your photographs and posts, which should be ultimately the main focus of your readers' attention. Same goes for fonts, it's good to pick only 2-3 fonts, one font being for your header and bigger titles used on your blog, one font for your sidebar, and the last one for your text. 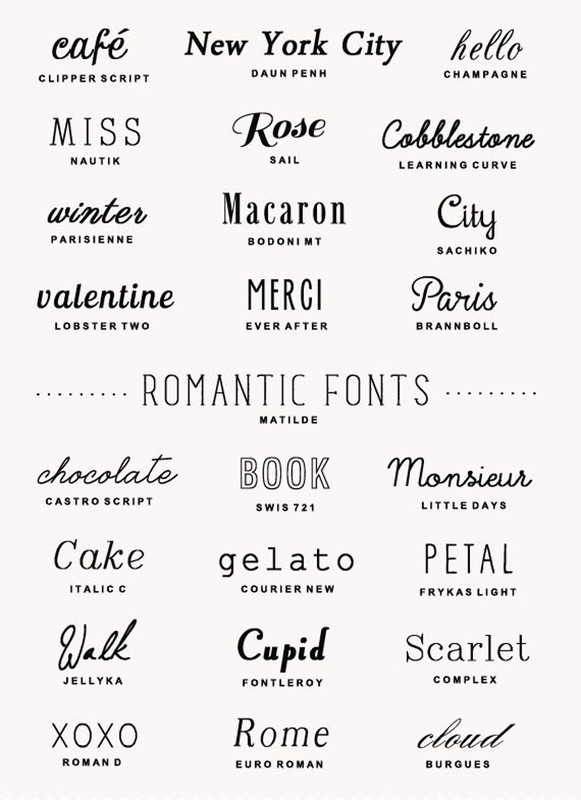 It's important for any well designed blog, newsletter, magazine, or anything else to have clear, legible fonts that complement each other well, and it can sometimes be tricky to decide which fonts look best together, so I found this helpful chart which I placed above to help aid you when choosing your blogs fonts. This step may be a little difficult if not familiar with how to create graphics on programs like photoshop. Your header is a very important part of your blog and can also be looked at as your blog's logo if it doesn't already have one. It doesn't have to be complex, but just your blog's name with a good font of your choice over a white background should be fine in most cases. Along with your header, you should have a navbar underneath with links to your blogs different sections and most important spots, like your about, contact, and blog's different sections. This could be the different posts that you publish put into their categories, like "DIY" or "Outfits". This is useful for readers who want to look back on certain posts of yours, or just are interested in browsing through one specific category of posts or another. I didn't know how to make navbars for the longest time, and I was so confused on how it was even possible to create an image with links in it that go to certain pages and sites. But, with a little bit of googling, I found the website where you can make them here, and it is honestly the easiest thing ever. Just create the image of the navbar itself in Photoshop, then upload it to this site and create the links! It generates a HTML code at the end that (for Blogger users, not sure about Wordpress or any other site) you'll insert underneath your headers code in your custom HTML box at the top of your blog. It is so simple, and something that you must have on your blog! Having some type of sidebar (or multiple, if you prefer) is key in the spread and success of your blog for so many reasons. For starters, it is the place where your readers, new and old, can access the many other features of your blog besides the homepage, like your different sections and also your archive. It's also the place where readers can see a short bio of what your blog is for and a short line about who you are, along with your social media buttons so they can keep up with you and your blog all the time. So when your setting your sidebar up, its very important to keep your contents in order by your personal importancy. It's always good to start with your short bio and your social media buttons/links, but after that, it's up to you to decide where your followers, sponsors, and everything else you have on your sidebar should fall. I say the order of importancy is so important, because when you think about it, it's sort of like a piece of artwork. You have a main focal point in which you're eye is automatically drawn to, and then it's surrounding parts. Keep in mind that your blog is your unique piece of artwork! In your content area, if your background color isn't white, then keep it at a very light neutral color, like a pastel color or a very light shade of gray. Keep a black font as well, to keep it easy as possible for people to read your text. If you have a black background and white font, or a distracting zig-zag pattern going on, or maybe some neon colored background, etc., it may be easy for you to see because you know what you post, but it's going to be quite a challenge for everyone else. So it's very important to keep your content area free of anything distracting to the eye! I've seen a few blogs (usually very popular blogs) with ads all over the place. Like, you can't even see the actual content of the blog due to the ads covering every bit of the screen. You don't want to do this. It's a distraction, and it's definitely tacky. If you're going to display ads on your blog, have a designated area for them in the sidebar. I've also seen ads on blogs where one will be displayed in between each post, and I think those are pretty neat too. But if you've got 5 ads flashing in your face over and under the header....no. Just no. Depending on the person, this may also drive away readers and frequent viewers, which is not what you want! Do you like how large or small the photos are on their blog, and you want your photos to be the same size on your blog also? Do you like the social media sharing options at the end of each of their posts? Write it all down, and try searching how to do each of the things you're wanting on your blog. There are tutorials all over the internet on how to do everything, so go find them! They're so helpful and I know they've helped me do so many things I was curious on how to do on my blog. Consider your options before you start paying outrageous prices for professionals to do it for you. And chances are, if you read through some tutorials and apply those desired changes to your blog, so much new information will stick in your head from it, which will help you later on if you decide to re-design your blog! Yes, you have your social media buttons included in your sidebar at this point, and your pages are all linked up in your navbar. But there's always room for extra when it comes to unique and user friendly pages on your blog. It's more of an optional thing to add, but I've seen quite a few blogs put links to pages on their blogs that said "New Reader? Start here!" as ways to greet and welcome new blog readers on a more personal level. While not for all blogs, I definitely think it's great to add little buttons on your blog that link to pages like this. If you're looking for an interesting way to add something new to your blog, I would definitely recommend that! Whether the images are in your sidebar, or part of your latest post, it's best to re-size your photos the way you want prior to uploading, because it makes everything look so much better. Having 5 ads in your sidebar of all different widths is going to look a bit sloppy, unless it's a deal where you have one ad with a width of 250 px for example, and then two underneath that are 125 px side by side. That would add up to 250, and the widths would all be the same. And I don't really know exactly why images all look the best re-sized to the same widths, but in my opinion I think it's another big contributor to the whole organization thing. It looks more professional, and it's just something I've noticed to look nice on a blog over the last few years. 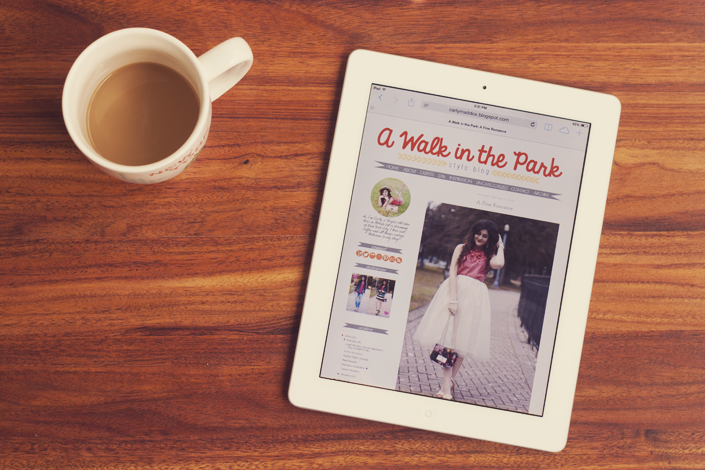 Also, if you're interested in purchasing a (blogger) premade blog layout instead of putting in a lot of work on your own, here are a few sites with some super nice templates that will make for an eye-catching blog! While these tips may not help you become a blog designing pro, they're definitely helpful if you're wanting to quickly put together a well presentable blog, or maybe if hiring a professional is a little out of your price range at the moment. Whatever the case, I hope these 9 tips really have helped you all in some way or another, and if you have any questions on anything that has to do with blog design that I may not have covered, please feel free to send me an email! I reply to all of my emails and will try to do my very best to help you, as I have done others in the past! Thanks for sharing all these tips! Very helpful! Wonderful tips. 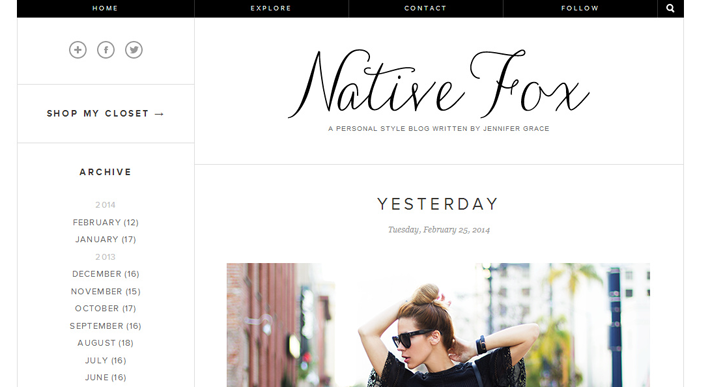 I have definitely come a long way with my blog design. I wish someone had told me these tips when I had first started!